Businesses open to the public must be open to everyone – a majority of Americans believe that, and huge numbers of small business owners themselves believe it, too. On Thursday, November 16, the Small Business Majority released a report detailing polling it had conducted from October 4 through October 23 of this year, regarding small business owners and their views on discrimination against LGBTQ people. Samples were taken from five different states: North Carolina, Georgia, Florida, Ohio, and Michigan. Overall, the report definitively states that small business believe discriminatory practices against LGBTQ customers is bad for business, and should not be allowed by law. Here, a breakdown and summary of some key findings. To download the full report and individual state reports, click here. Sixty-five percent of respondents indicated that it was wrong to deny LGBTQ people goods or services based on an owner’s personally held religious beliefs, with fifty-three percent indicating strong support. Polling was highest in Ohio (70%), Michigan and Florida (69% each). Half of the entrepreneurs polled expressed that businesses should not be able to refuse services to LGBTQ people because they believe it violates their right to free speech or freedom of expression. Support was strongest in Michigan, with 60% of respondents saying free speech is not violated and 66% saying freedom of expression is not violated. The next highest results were in Florida, with 53% and 60%, respectively. 55% of small businesses believe that laws preventing discrimination based on sexual orientation and gender identity ultimately improves their bottom line, because it will allow them to attract the best and brightest employees regardless of sexual orientation or gender identity. The broadest support was in Michigan, with 56%, while Georgia, Florida, and Ohio each had 51%, with North Carolina at 50%. 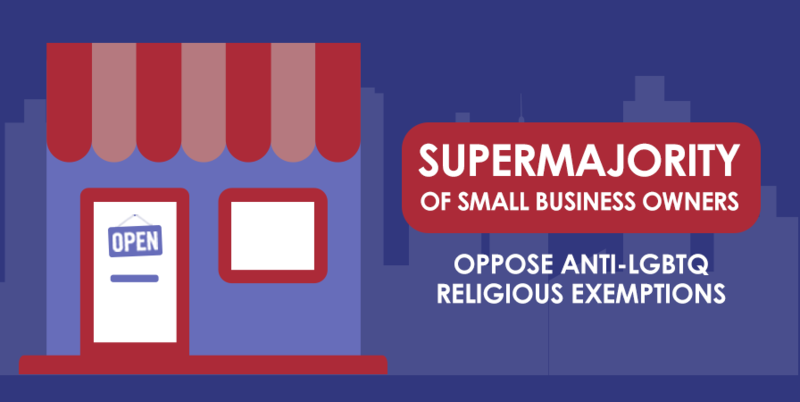 The case is clear- small businesses are in support of the effort to pass comprehensive nondiscrimination protections across the country and at the state level. By acknowledging that it is wrong to use religious beliefs, free speech, or artistic expression as a reason to deny services to LGBTQ people, the business community helps advance the work of Freedom For All Americans and other groups nationwide working to protect the LGBTQ community from discrimination.